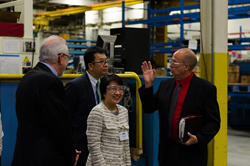 Ambassador Hsu learns about the FS-Elliott and Fusheng Group formula of success and tours manufacturing plant. The FS-Elliott and Fusheng Group story serve a wonderful example of a mutually beneficial collaboration between businesses in Taiwan and the United States. FS-Elliott Co., LLC, a leading manufacturer of oil-free, centrifugal air and gas compressors, recently welcomed Director General Ambassador Lily Hsu along with key officials of the Taipei Economic and Cultural Office in New York (TECO) to their headquarter office. The goal of the visit was to learn more about the successful relationship between FS-Elliott, based in the United States and their parent company, The Fusheng Group based in Taiwan. Ambassador Hsu and her team met with senior officials at FS-Elliott to review the company’s history including the acquisition of the PAP Plus® compressor line by The Fusheng Group, forming FS-Elliott in 2003 as well as recent initiatives and achievements. Due to the rapid growth over the last 13 years, the group was interested in hearing about the FS-Elliott and Fusheng formula of success and how it could be applied to other Taiwanese companies. “The FS-Elliott and Fusheng Group story serve a wonderful example of a mutually beneficial collaboration between businesses in Taiwan and the United States. We look forward to seeing more success stories like FS-Elliott,” stated Ambassador Lily Hsu, Director General of TECO in New York. As part of the visit, the Ambassador toured the ISO 9001-certified manufacturing facility where FS-Elliott’s centrifugal, oil-free air compressors are built and tested. Members of the manufacturing team demonstrated the five-axis milling machines responsible for producing and customizing impellers to meet a customer’s specific aerodynamic needs. The tour continued through each step in the manufacturing process and concluded with a visit to the testing facility where each unit is carefully inspected and tested before being packaged in-house or shipped to one of FS-Elliott’s global packaging facilities. FS-Elliott Co., LLC, is a leading manufacturer of oil-free, centrifugal air and gas compressors with sales, service, and manufacturing locations around the world. First introduced to the market over 50 years ago their energy-efficient machines incorporate the latest aerodynamic and control system technologies to ensure optimum performance. For more information, visit http://www.fs-elliott.com.